Benchmade knows that a quality tool can mean the difference between life and death. This is why their Black Class line of professional products are all designed with the utmost care and attention to detail. Their Protagonist Fixed Blade Knife is no exception. This reliable and dependable tool was created for outdoor enthusiasts, law enforcement officers, and members of the armed forces. 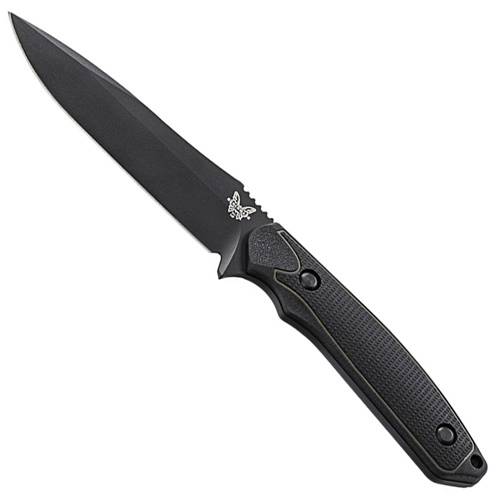 It features a black-coated tactical blade and a versatile drop point shape for making controlled slices. The handle is composed of Grivory, a stiff plastic, and a rubbery Versaflex overmold. A lanyard hole and MOLLE-compatible sheath are included. Measures 232 mm (9.1 inches) in overall length.